Jay Reise is the composer of the opera Rasputin which was commissioned by the late Beverly Sills and premiered by the New York City Opera in 1988. It was described in The Washington Times as “a spellbinding, challenging and profoundly beautiful creation.” Rasputin was given its highly successful Russian premiere in Moscow by the Helikon Opera in September, 2008, and reprised in further performances in January and February, 2009. Reise’s Oscar Wilde-based ballet fairy-tale The Selfish Giant was commissioned and premiered by the Philharmonia Orchestra in London in 1997. Other recent works include The River Within (Concerto for Violin and Orchestra) (2008) premiered by Maria Bachmann and Orchestra 2001; the Concerto for Horn and 7 Instruments (2006), commissioned and premiered by the Network for New Music and Adam Unsworth; and the piano quintet Powers That Be (2005), commissioned by the Barlow Foundation and premiered by the Cassatt Quartet and Marc-André Hamelin. Reise was born in 1950 in New York City and has lived in Philadelphia since he was appointed to the music faculty at the University of Pennsylvania in 1980. Previous to his appointment at Penn, Reise taught for four years at Hamilton College during which he composed his first two symphonies supported by grants from the National Endowment for the Arts and a Guggenheim fellowship. Symphony of Voices was premiered at the Monadnock Festival, and his Second Symphony was premiered by the Syracuse Symphony, conducted by Christopher Keene, and performed subsequently by the Philadelphia Orchestra. His Third Symphony was supported by the Dietrich and Rockefeller Foundations and premiered by the Long Island Philharmonic. Other awards and fellowships have come from the Fromm Foundation, Bellagio, the Camargo Foundation, and twice from the National Endowment for the Arts. The music of Jay Reise music has been performed widely both in the United States and abroad including an all-Reise retrospective concert in Moscow in 2000. He has been a recipient of the US-Japan Creative Arts Fellowship and has served as Director of Contemporary Music at the Grand Teton Music Festival. Deeply influenced by Carnatic (South Indian) music and jazz (especially Jimmy Giuffre and George Russell), Reise works with a technique that he calls “rhythmic counterpoint” in which rhythmic motives are developed within the phrase such that the cadence point is implied by the rhythms alone. This technique has been a part of his music since 1990. Among his recordings are the chamber concerto Chesapeake Rhythms and Concerto for Cello and 13 Instruments recorded on CRI by Orchestra 2001. The Devil in the Flesh and Other Pieces (Albany) features pianist Marc-André Hamelin. 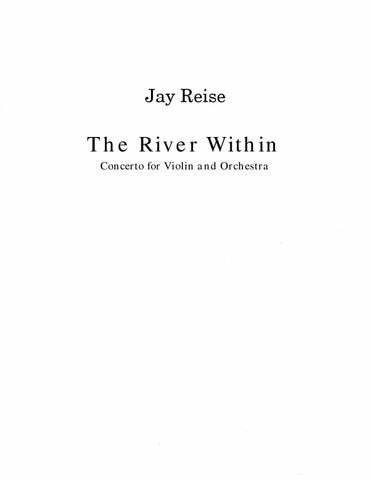 Jay Reise: Chamber Music (Albany) was released in March 2008 through support from the Aaron Copland Fund for Music. Gregory Fulkerson, Jerome Lowenthal, Charles Ullery and the Cassatt Quartet have also recorded his music. Jay Reise’s articles have appeared in Opera News, Nineteenth-Century Music, Perspectives of New Music and Reading World Literature. His music is published by Merion Music/Theodore Presser Co.
for Eleven Players 16:00 1 1 1 0 – 0 0 0 0; 2Perc. Pno. Str. Poem-Caprice for 6 Instruments 15:00 Fl.(dbl. Picc.) Cl. Vln. Vcl. Perc. Pno. for Orchestra 8:00 2(Picc.) 2 2 2 – 3 3 3(B.Tbn.) 0; 3Perc. Pno. Str. for String Orchestra 10:00 Str. A Choreographic Tone Poem based on the story by Oscar Wilde 25:00 2(Picc.) 2 2 3(Cbsn.) – 4 3 3 1; Timp. 2Perc. Org. Str. 22:00 3(Picc.) 3(E.H.) 4(EbCl./B.Cl.) 3(Cbsn.) – 6 6 3 1; Timp. 5Perc. Str. 18:00 3(Picc.) 3(E.H.) 3(B.Cl.) 3(Cbsn.) – 4 3 3 1; Timp. 3Perc. Pno. Cel. Hp. Str. Concerto for Violin and Orchestra 26:00 Solo Violin; 1(dbl. Picc.) 1 1 1 – 1 1 1 0; Perc. Pno. Str. for Bassoon and String Orchestra 13:00 Bsn., Str. for Soprano and Orchestra 16:00 Solo Sop. ; 3(Picc.) 3(E.H.) 2 2 – 4 2 2 1; 3Perc. Hp. Str. …this score is far more compelling than most comparable works… Reise has achieved a rare balance between accessibility and complexity.